I'm part of the Product team, which sits in the overlap of design, technology and business. 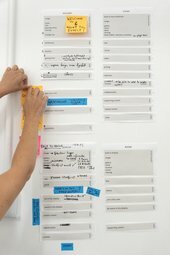 I work with people at Tate to build digital products that help us bring the national collection to everyone. I do lots of user testing to ensure products work and are accessible across devices, needs and abilities. WHAT QUALIFICATIONS, KNOWLEDGE, SKILLS, EXPERIENCE OR INTERESTS DO YOU NEED FOR YOUR CAREER? An insatiable interest in how people behave helps! Working out how people will use a product is satisfying and having a keen eye for design helps keep things ticking. Knowing your tech stack is a huge benefit as it helps to scope work and to hunt bugs when things break. But this is only something you get to know when you join teams as every tech stack is different. You don't have to be a programmer, it's all about learning as you go and embracing constant change. Fionnuala updating a paper mock up of website page heirarchy. We develop our website bit by bit using a method called Agile. The team works in 3 week building and brainstorming sessions called Sprints. Each Sprint has specific focus. At the end of a Sprint, we go live with any updates or changes before moving on to the next cycle. A normal day involves meeting people to chat about new features and mocking up new user journeys or designs on paper. I would also meet with developers or designers to work out the technical side of things. I also use project management tools like Trello and Jira to ensure new releases are on track. I arrange user testing with people in the gallery or online to see how people use products. We listen to feedback to make what we have designed better bit by bit or test new features before we start to build. I also spend lots of time working out why things break then fixing them (if I can). WHAT ARE THE MOST REWARDING AND MOST DIFFICULT THINGS ABOUT YOUR JOB? The best thing about my job is the variety. I get to work on problems, design solutions, meet users and people who are passionate about what they do. Doing this for Tate is incredibly rewarding. Fionnuala conducting user testing at Tate Britain. It's important for me to build products that make a positive impact. If you don't believe in what you're building, it's hard to stay motivated. The difficult thing is keeping all the plates spinning in a very small team. But I love the fact things never stay the same, it's impossible to get bored. WHAT ADVICE WOULD YOU GIVE TO SOMEONE INTERESTED IN A CAREER IN PRODUCT DEVELOPMENT?